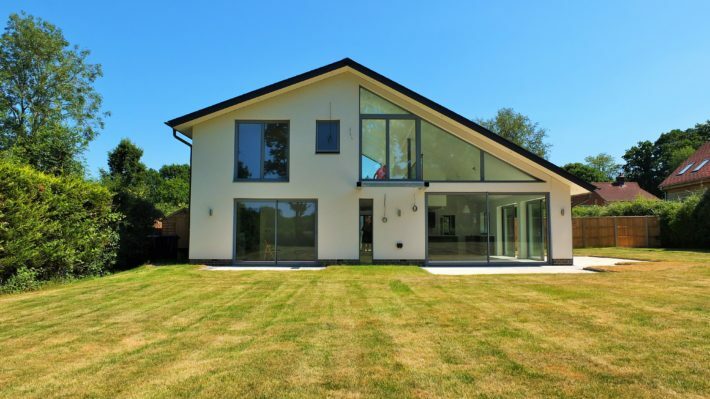 On a sunny spot just outside the large village of Cranleigh, a stunning contemporary Scandia-Hus stands amidst the surrounding fields and trees. The house is hidden from the road by the owners’ current mid-century, architecturally designed home, and is approached from a long gravelled drive. As the building slowly appears into view, the white render enables the frontage to shine brightly in the sunlight, a stark contrast to the vivid greens of the countryside around it. The plot was obtained as part of the purchase of their original property in 2005, as the home came with an acre of land. Rosemary and Norman didn’t think of doing much with the large garden until there was a change in planning policy. A new government target of building 300,000 homes a year in England came into effect, to combat the housing shortage ‘crisis’, and local councils became keener to grant planning permission. It seemed a good time to build for the couple and seeing their neighbours take the opportunity motivated them to move forward. Norman, a former architect, had a clear vision for his next home. Due to health issues and the need to future proof, the idea was to create a contemporary, low maintenance bungalow that suited their needs. He began to sketch out a design, but the couple weren’t prepared to build themselves and so needed to source a company to do the hard work for them. 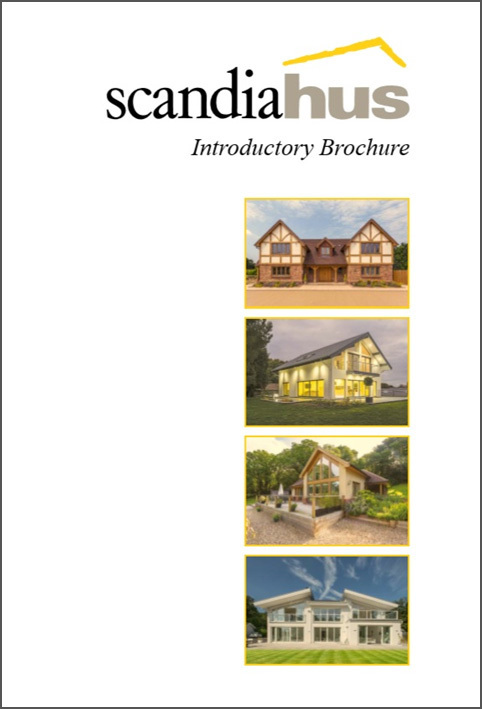 They visited a few local exhibitions, including the Homebuilding and Renovating Show at Sandown Park and Build It Live in Kent, and came across Scandia-Hus. They liked the Scandinavian vibe as it suited the feel they were trying to achieve with their project. Working alongside Scandia-Hus, Norman’s initial vision of single storey living was developed, however after detailed costing had been carried out it was decided to that to make the building more cost effective and efficient to build, the footprint should be reduced and the height of the building increased allowing another floor to be constructed. An added bonus was the greater living space that could be used to allow Rosemary to continue running her Bed and Breakfast business in the new home. With this in mind, three bedrooms were added to the drawings on the newly planned first floor, all with en-suites so they could be used as guest rooms. Due to the unique asymmetrical roofline, the upstairs would only be present on one side of the building, which gave way to the idea of a feature galleried landing fantastically lit by multiple Velux windows and an abundance of glazing on the rear elevation. 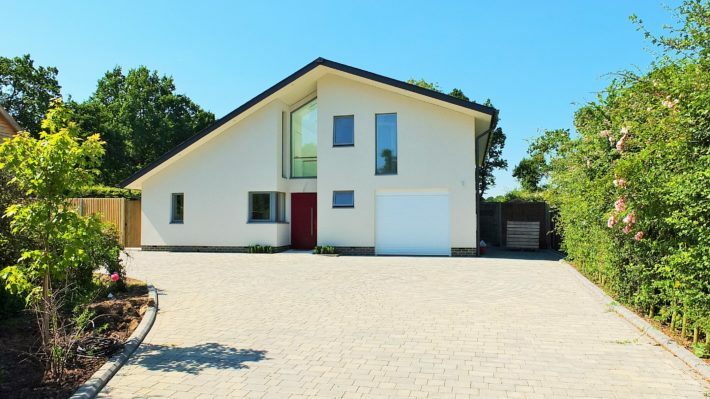 Norman describes the layout of the 3,000 square foot house as being split into a ‘sleeping block’, with the guest bedrooms and their master en-suite on one side of the house, and a ‘living block’, located on the single storey side. The arrangement is logical and an efficient use of space (what else would you expect from a retired architect?). The latter ‘block’ incorporates an incredible kitchen / dining / family area with aluminium sliding doors on two sides giving the occupants dual aspect views of the south west facing garden. After nine months of work on site, the contractors left. The result is an attractive, bespoke, energy efficient property that works for the couple now, and will continue to do so in the future. Rosemary and Norman are looking forward to growing old together in their spectacular Scandia-Hus home.